Lite Jot » Blog » New: Image Uploading, Image Text Search, and More! It’s been a long time coming. We admit it. Lite Jot is still in beta mode, but adding media into your notes is one of the advantages of online note-taking. After quite a bit of planning, we’re very excited to announce that image uploading is here, and fully integrated with image text search, gallery view, and of course, incredible ease of use. Uploading images to Lite Jot is easy. There are a couple of ways to do this. The first way is by clicking the image upload tab. Underneath the jot textarea, within the jot toolbar where the heading and checklist options are, is a tab called image. Clicking this will open a window where you can select one or many images to upload. Once you upload an image, it’ll be processed and searched for text (to be explained in the next section). Lite Jot also supports drag and drop. Simply select a file from your computer, drag the image onto the page, and you’re done! Our favorite aspect of the image upload feature is the capability to find them with the jot search tool. Images are scanned for recognizable text upon upload. The more clear and legible the text is, the easier it is to recognize. For instance, text in screenshots is very recognizable because the text is uniform and horizontal, and the lighting is consistent. Whereas in a photo, lighting can differ and handwriting is not always as legible, such as when letters begin to connect. That’s not to say that handwriting in photos isn’t recognizable. In fact, it works reasonably well. 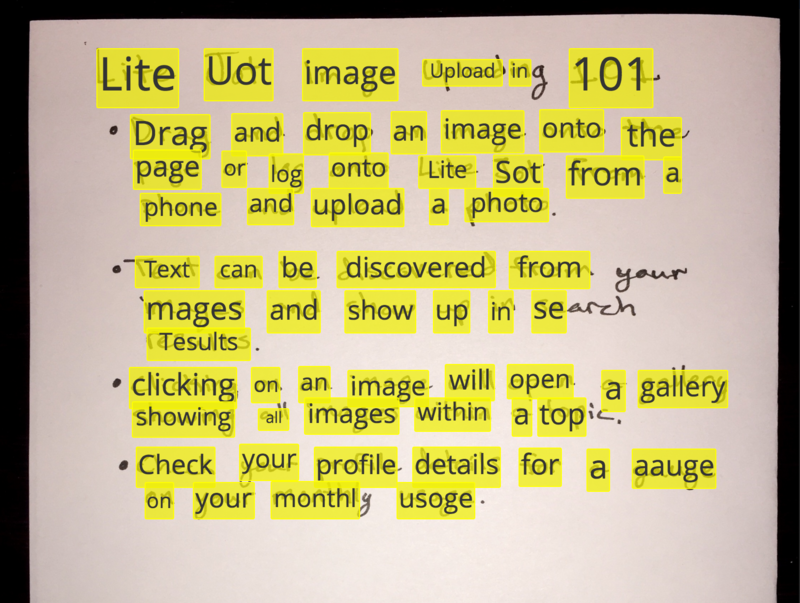 As you can see, Lite Jot found the image and annotated the text directly on the photo exactly where the words show up in the photo. This feature works best where the letters have appropriate spacing and are unambiguous. After an image processes, you can click on it to view an enlarged view. We figured you wouldn’t want a list of giant images taking up space in your jots list, so images greater than a particular width or height are resized into thumbnails (unless you’re searching, then images will show in a larger size). This also saves time unnecessarily loading large images, as you most likely will not need to view every image within a topic each time you open it. The recognition turned out pretty well here. Again, once letters begin getting closer, more connected, or ambiguous (such as an “a” being read as an “o”), we start to see error. We encourage you to give it a try yourself and see how well it works for your needs, such as business cards, notes, or screenshots. 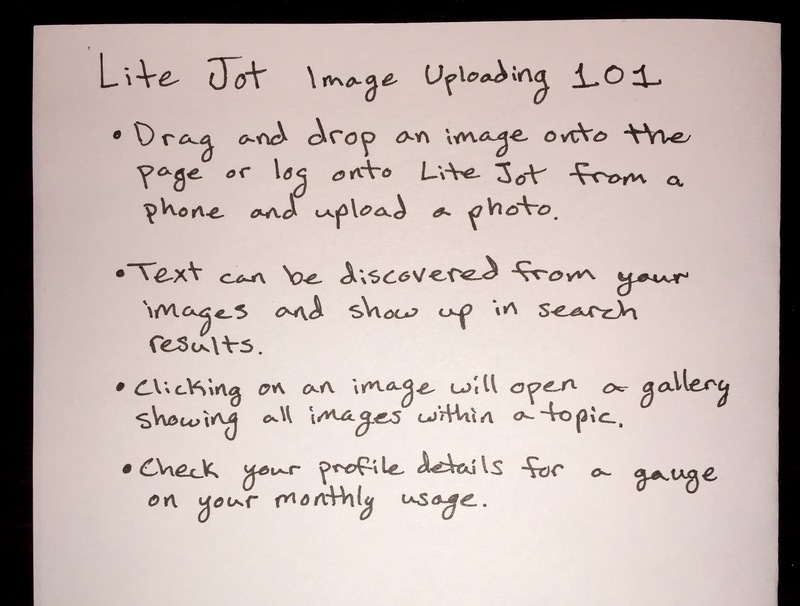 Lite Jot currently allows up to 75 megabytes of uploads per month. You can find your current usage by going to your profile details page. Your profile details can be found by clicking your user photo. At this time, Lite Jot allows the most common image types: jpg, gif, and png. Your images are converted to jpg upon upload.